Electronics for stationary and mobile hydraulics | Tucson Hydrocontrols Pvt. Ltd.
Modern machines and work equipment are subject to steadily increasing requirements. Ever more functions are needed. On the one hand, machines can be deployed in a greater variety of duties, but on the other hand their development is also more complex. More than ever, solutions for the simplification of complexity are in demand. These have to support a modern control structure and enable flexible, adaptable use. Therewith, the development of a machine should become clearer, more modular and hence simpler. The decentralisation of control tasks is one of the most important approaches in finding solutions that comply with the demand for simplification and modularity. It allows the “outplacement” of technology-specific knowledge – such as hydraulic control tasks – to third parties. Thus the strain on the developer’s and designer’s task is relieved, and they can concentrate on the core tasks of the machine – which also has a positive effect on the time-to-market factor. The SD7 control for stationary systems with control cabinets, and the MD2 control for mobile hydraulics were developed particularly from this point of view. Sub-processes can run decentrally. For example, SD7 or MD2 can take over the task of controlling the position of an axis “on site”. Thus the central control system is freed of specific control tasks, less computer capacity is needed and less attention has to be paid to control cycle times. The communication with the main control system can take place via analogue or digital signals, or via a field bus. 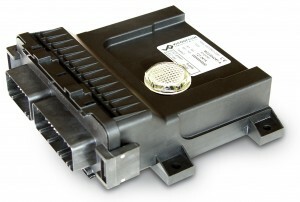 The digital MD2 amplification and control module was specifically developed for the control of hydraulic valves under extreme environmental conditions. The use of this module is particularly appropriate for wet conditions, where there are vibrations, extreme temperatures or fluctuating supply voltages. By the robust and compact design, it is excellently suited to mobile applications. The operation of control electronics has to comply with a range of different demands. It must be easy to adjust and allow tools for quick and easy commissioning. These requirements can be fully met through the digitalisation of the control, using the options of graphic display of the process data flow and the analysis and diagnostics tools. The units are available purely as amplifiers, for the control of proportional and switching valves or also in combination with control functions. In this way it is possible to simply and rapidly build up a range of controllers such as pressure, volume flow or position controllers. A standard-conforming CANopen and Profibus DPinterface is available for communication in a modern field bus system. The modules have digital inputs and outputs as well as powerful PWM outputs for the operation of the solenoid valves. In addition, the digital inputs can process frequency or PWM signals without any problems. Up to four analogue inputs with a maximum resolution of 16 bits are available for processing the analogue process signals. The allocation of inputs and outputs to each other is variable. This allows optimum utilisation of the existing hardware and guarantees flexible adaptation of the application without any programming knowledge. The parameterisation is carried out via a software called PASO, which is very easy and intuitive to use. The connection between computer and SD7, or computer and MD2, takes via well-known and proven USB interfaces. The amplification and control modules have a new concept for illustrating the entire signal process path – from uploading the command value via various additional functions through to the valve flow calculated from these. The user will see at a glance the condition of his control system at any point in time. If needed, the individual process parameters can be displayed on the screen in real time. If the module is used as controller, it is practical in many cases to view for individual or groups of process data at exactly the same time. This is the only way to optimise efficiently deviations from the rule, and hence the overall control behaviour of the system. For this purpose, the SD7 and MD2 are capable of recording and graphically displaying up to four freely selectable process data simultaneously. 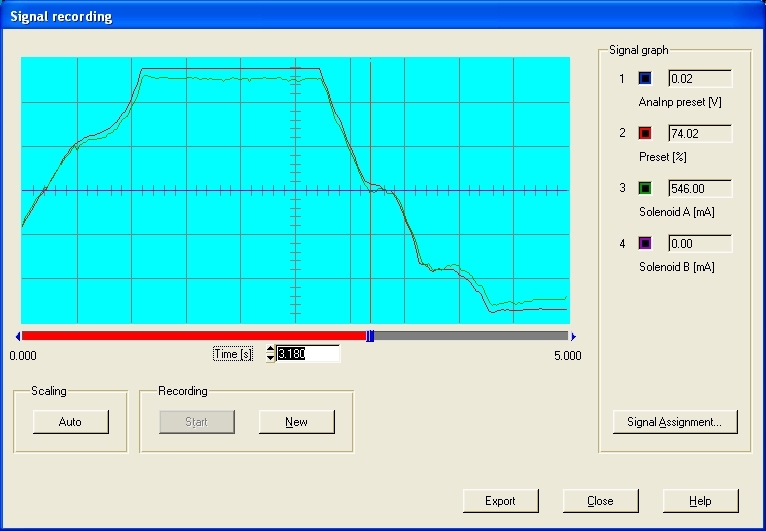 This oscilloscope function provides the commissioning engineer with the tool to quickly find potential improvements for the controller settings and to visualise the result of the correction in a simple manner. In this way, the parameters can be easily changed and saved without losing the overview. Simply a brilliant matter!